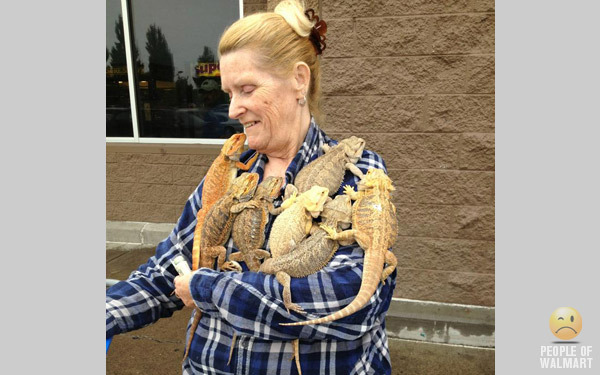 Most people don't take their exotic pets shopping but when they do, they take them to Walmart. We're not sure why... Wally World's pet section stocks neither Chupacabra Chow nor Liger Litter. 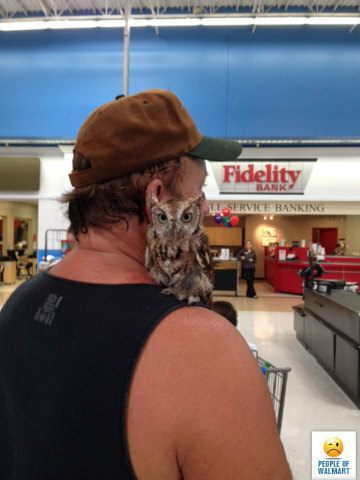 In any case, let's meet some of the people & pets you do NOT want to find yourself behind in the checkout line. Hmm, this dude looks a little old to be a Harry Potter fan. Then again, the first HP flick was released about 15 years ago and for all we know the owl could be both magical and immortal. It'll also probably give you a nasty case of hogwarts. 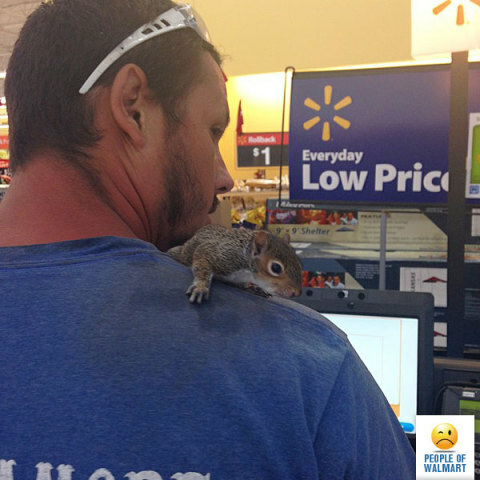 Bring your pet chipmunk to Walmart? I rodent do that if I were you, unless of course they've rolled back the price on nuts. Seed what I did there? 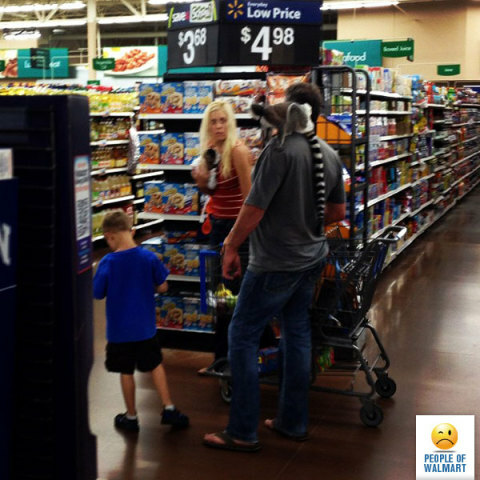 If you've got a Ring-Tailed Lemur perched upon your shoulder you'd better be Marlin Perkins or John Cleese – neither of whom shop at Walmart (as far as we know). 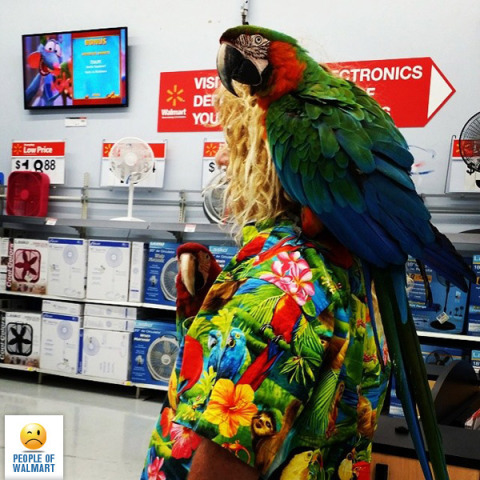 These officially endangered primates are native to Madagascar so what's one doing in a Walmart in Florida? 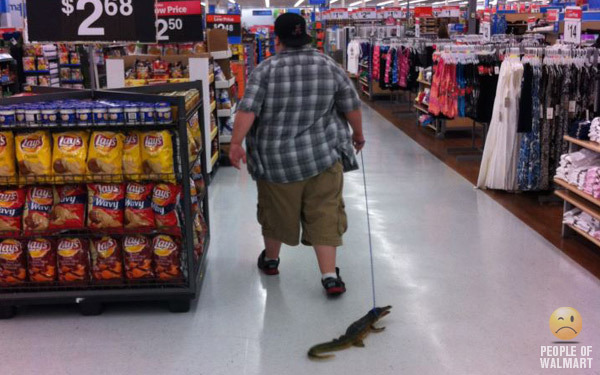 Speaking of Walmarts in Florida, check out these refugees from the rainforest. Dude's probably on his way to the CD rack in search of a new Jimmy Buffett compilation. Did you know some of Buffett's more devoted fans call themselves “Parrotheads”? That might just explain the photo above. 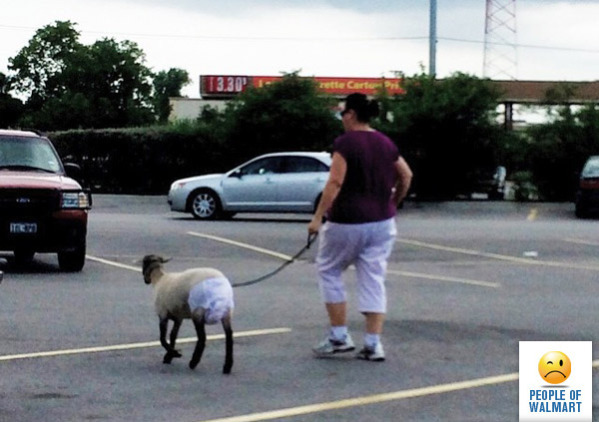 Would you bring a goat to Walmart? Depends... what I mean is, be sure Billy's wearing Depends before you hit the aisles. At least this good shepherd's showing some consideration and the leash helps too: most folks who get rammed at Walmart have it happen in the parking lot, not inside the store. 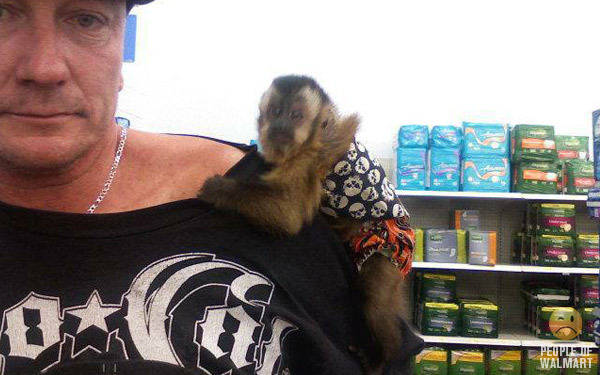 If you thought the monkey from The Hangover was badass, you haven't seen this punk primate. See all those skulls on his shirt? That's not a décor theme, it's a body count. 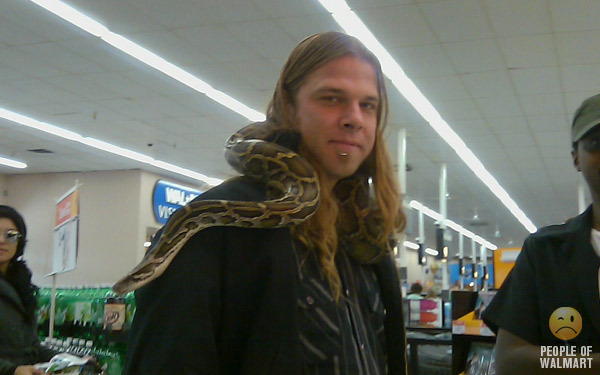 Walmart shopper speak with forked tongue – plus, he hasn't got a leg to stand on nor a pot to python. OK, we're done here and this dude's eerie smirk is getting me rattled. 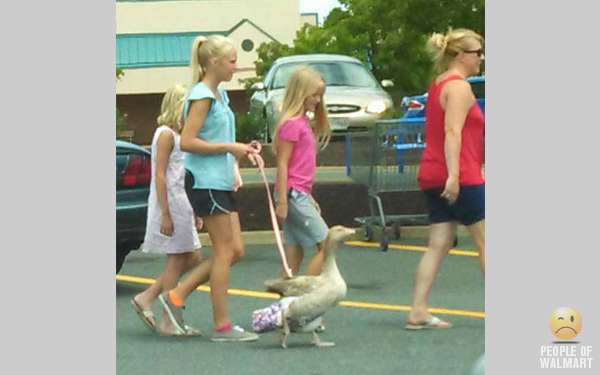 Either this otherwise wholesome and corn-fed family is taking their pet goose shopping or Walmart's now selling live holiday dinners. Maybe this is a goose that lays golden eggs... or maybe not, and you'd best not step into what it DOES lay. 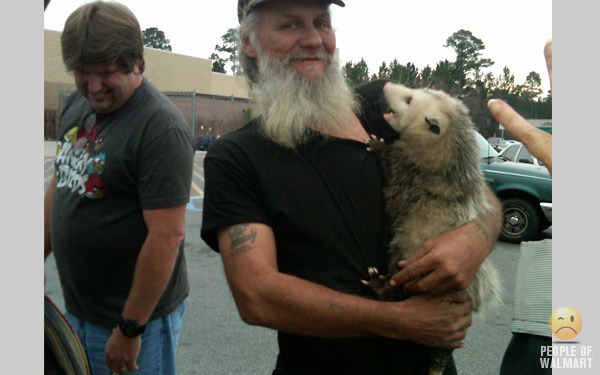 Don't mind this guy, he's just playin' possum... just pray the menacing marsupial's had his shots. There may be a few more youngins hiding in his beard but I wouldn't check it with YOUR hands. It's a pity Jim Morrison has left us 'cuz here's his dream date clothed in flannel and lizard-skin. At least the flannel isn't living. I want to believe what she's “wearing” is only an oddly-textured flotation vest (think Marty McFly meets Jurassic Park) but this is Walmart, where all your dreams turn into nightmares. Thanks and a tip of the cap as well to People of Walmart, the hard-working source of these all-too-real images you only WISH were 'shopped! Birds & Planes: A Hate/Hate Relationship -- Animal Video of the Day!!! True Facts About the Angler Fish -- The Animal Video of the Day!! !